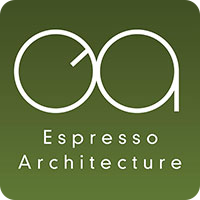 At Espresso Architecture we believe that good quality, innovative design should be available to everyone, no matter what the size of project. Working from our Oxfordshire offices, we practice predominantly in and around Bicester, Brackley, Buckingham, Banbury and the surrounding villages. The depth of experience of our team of Architects offers our clients the confidence that all projects will be well managed and a considered design proposal forthcoming. Our current clients range from home owners to commercial developers, schools, churches and Local Authorities. At the heart of each of our schemes is the desire to deliver an original design whilst meeting the budget and time constraints often present in modern projects. A keen interest in green buildings and a passion for modern, contemporary yet sympathetic design, caters for schemes new and old alike. We have experience in cutting edge environmentally responsive ‘eco’ architecture through to Listed Building and Conservation work. We are able to offer assistance with every project phase, from Feasibility Design, Planning, Detailed Design and Building Regulations through to onsite assistance and Project Management. We look forward to discovering more about your project soon.